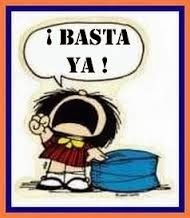 Spanish For Social Change: Ya Basta! Enough is enough! Ya Basta! Enough is enough! This translation jumped out at me in the chapter Occupy: prehistories and continuities by Samantha Shakur Bowden. Not sure where she got it, but I like it. I notice Ya basta! already has a wikipedia entry in English with this definition. I have previously blogged about the Colombian Basta Ya! report being officially rendered as Enough already, but this version is much better for street chanting. No real difference in my mind between basta ya and ya basta. Of course there's a tiny difference in emphasis, but they seem to be used interchangeably. As a British English speaker, "enough is enough" sounds right to me. That's what I heard used as a child when my mum was annoyed, before I ever heard the Spanish word "basta". I'm used to "enough already" by now, but it still has a North American ring to my ears. Thanks for the honorable mention. As I noted in the chapter, "Ya Basta!" (Enough is Enough! as opposed to Basta Ya!) came from the book "They Can't Represent Us: Reinventing Democracy from Greece to Occupy" by Marina Sitrin and Dario Azzelli. Thomas Oleson also mentioned "Ya Basta" in his "International Zapatismo" tracing it back to the EZLN. PS. I'm loving the idea of York for my PhD!